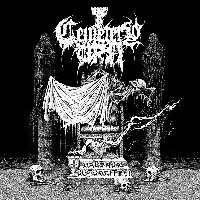 For over ten years, CEMETERY URN has been assaulting the extreme metal scene, releasing two albums on their very own Cemetery Recordings and booking two highly acclaimed tours across the United States. Formed in Melbourne, Australia by ex-ABOMINATOR, BESTIAL WARLUST singer and guitarist Andrew Gillon, front man Damon Bloodstrom of the same background, and drummer Matt Crossingham, who has notably played in BELLIGERENT INTENT, each member is a veteran of the Aussie death metal movement and have even branded the album of which this review is the subject "Australian Barbaric Death Metal." Barbaric it is indeed, "Victim Defiled" opening with building intensity, bursts into a slamming attack of brutality – a mood that is present throughout. "Ghost of Suicide" pummels the listener at breakneck speed, with plenty of blast and chugging to compliment the vicious screams. A thrashy solo gives diversity to the already varying tempos, an element the four piece has quite a knack for on this release. "Death Mask Preserver" flaunts this quite well, a slow burning, almost doomy track at first, repeating a hypnotizing riff, the drums evolving into a constant double bass, eventually settling on a tasty groove. Never once compromising the straight up death metal sound, "Down The Path of The Dead" could easily be an INCANTATION song, the hard hitting never ending. "Manifesto Putrefactio" is another down tempo escapade through the death doom wastes. "Purified Living Flesh" is a pulverizing blend of raw aggression and unbridled chaos, opening with a catchy groove that at once explodes with blast beats, tremolo picking and plenty of palm muted grooves to keep your head banging. The nine song LP ends with much of the same formula as the rest of the album on "Tendrils of Defilement," with a very expressive guitar solo a fourth of the way in. "Barbaric Retribution" is a supremely solid record that builds off the quartets already substantial discography. It is as brutal as it is doomy at times, and it is definitely something you want to check out if you are a fan of BOLT THROWER or INCANTATION.